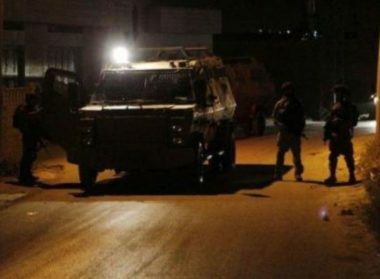 Israeli soldiers abducted, on Monday at dawn, 18 Palestinians from their homes, in several parts of the occupied West Bank, the Palestinian Prisoners’ Society (PPS) has reported. The invasions targeted many cities, villages, towns and refugee camps across the West Bank, after the soldiers invaded them and surrounded entire areas. The PPS stated that the soldiers invaded and violently searched dozens of homes across the West Bank and interrogated many Palestinians while inspecting their ID cards. The soldiers installed roadblocks, before stopping and searching dozens of cars, and also interrogated many Palestinians while inspecting their ID cards. Furthermore, the soldiers invaded the Jenin office of the Popular Struggle Front in Jenin city, after smashing its main door, and violently searched it causing damage, in addition to confiscating computers. Abdullah Jihad Bani Odah, Tammoun – Tubas. Adam Bani Odah, Tammoun – Tubas. Mohammad Abdul-Aziz Bisharat, Tammoun – Tubas. Tha’er Mer’ey, Jenin refugee camp – Jenin. Qais al-Ghoul, Jenin refugee camp – Jenin. Anas Abu Rayyan, Jenin refugee camp – Jenin. Baha’ Rahhal, Jenin refugee camp – Jenin. Ahmad Nasr Thawabta, Beit Fajjar – Bethlehem. Abdul-Latif Ahmad Thawabta, Beit Fajjar – Bethlehem. Rami Issa Taqatqa, Beit Fajjar – Bethlehem. Ramzi Ribhi Ataya, Kafr Ni’ma – Ramallah. Nafeth Abdul-‘Al, Kafr Ni’ma – Ramallah. Suleiman Mohammad ad-Deek, Kafr Ni’ma – Ramallah.